One persons was killed and two people were injured in a head-on crash in Spring Valley Sunday afternoon. 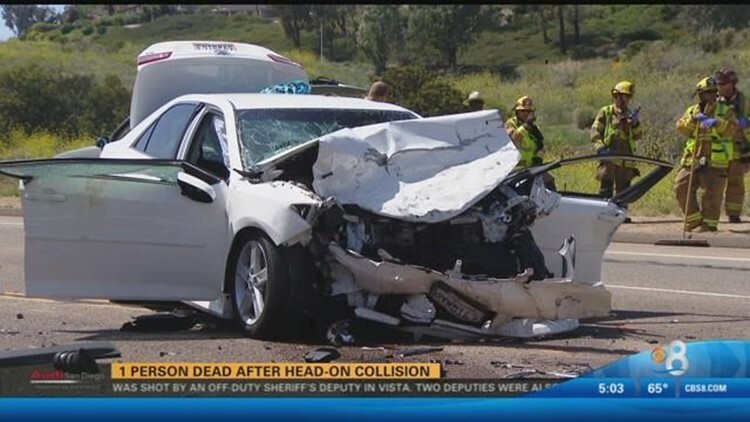 RANCHO SAN DIEGO (CNS) - A passenger killed in a head-on collision on a curving roadway in Rancho San Diego over the weekend was identified Monday as a 67-year-old Spring Valley woman. Clementine Scott James was fatally injured when the southbound 2012 Toyota Camry in which she was riding was hit by a northbound 2015 GMC Terrain SUV on Jamacha Boulevard near Trace Road shortly after 12:30 p.m. Sunday, according to the California Highway Patrol and the county Medical Examiner's Office. The 21-year-old El Cajon man behind the wheel of the SUV failed to negotiate a slight curve in the roadway and crossed into oncoming traffic, CHP Officer Kevin Pearlstein said. James and her 70-year-old husband, who was driving, were pulled from the wreckage of their car after the crash. James went into cardiac arrest and was taken to Sharp Memorial Hospital, where she was pronounced dead shortly after arrival, according to the Medical Examiner's Office. The SUV's driver suffered a broken right leg and was taken to a hospital to be treated, Pearlstein said. The Camry's driver sustained only minor injuries. It was not immediately clear whether drugs and/or alcohol were factors in the crash, according to the officer.